While blog content should forever remain the backbone of your content marketing efforts, there are definitely some distinct advantages to leveraging outside platforms to expose your content to a new audience. One such platform that I feel is very underutilized is SlideShare. Given how visual content marketing has become in the last few years, many smart brands such as HubSpot and Twilio are making conscious efforts to create amazing slideshow content for generating more leads. The reason that some marketers may be hesitant to embrace SlideShare is that they are unsure about just how to maximize their presence on the platform. As someone who had hit the home page numerous times and sent thousands of visitors to my sites and my client’s sites from the platform, I wanted to reveal 10 specific strategies for getting the best return from your content on SlideShare. Let’s get started! 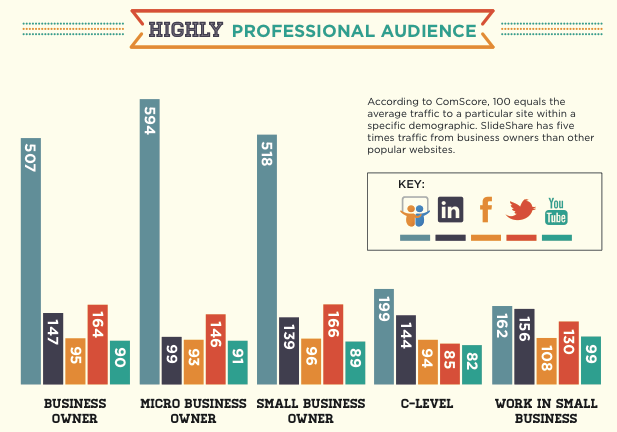 SlideShare has the most professional audience on the web, even more so than LinkedIn. While SlideShare prides itself on being the “quiet giant” of content marketing, I would take it a step further: It’s one of the greatest untapped resources for many B2B marketers. Few platforms can compete with such a professional audience. Instead of getting the often bouncy social media traffic from places like Twitter, on SlideShare you are getting in front of decision makers and other business-minded folks. Knowing this, you also need to realize that the kind of content that caters to small business owners and working professionals is the kind of content that does the BEST on SlideShare (although other sorts of content can certainly do well). Bold, bright, interesting, controversial: This title slide has it all! Why are title slides so important? Simply enough, it’s because your title slide will be the first thing that people see on your presentation — this includes when it’s embedded onto other sites as well as when it is featured on SlideShare itself in the “related presentations” sidebar (or potentially, on the home page). Having a highly clickable title slide will generate more views as curious browsers stop to check out just what your presentation is about. With a generic or boring title, you’re going to lose out on a lot of people who may have potentially enjoyed your content. Ending your presentation with a call-to-action that heads back to your own site is a no-brainer, but one method that is also extremely useful is to end presentations with a call for more content. This strategy is only viable if the presentation itself can be informative even with just a portion of the content available. For instance, an 11-slide presentation ending with a call for more content would do quite poorly — there’s no way you could create enough incentive to download more content with just 11 slides (or at least, it’s very unlikely). Guest posting is essential for driving SlideShare views if your company blog doesn’t currently have a large enough audience to leverage. While this process of writing for others is awesome for more exposure, in regards to SlideShare, it is essential for hitting the home page if your own company blog doesn’t have enough readers. The thing with SlideShare’s home page is that presentations that are currently performing well have a better chance of being seen and manually selected for the front page feature. If your company blog just isn’t at the stage where it can drive 1,000+ clicks to your latest presentation, the next best thing you can do is to commit to guest blogging to generate those initial views. If you can get enough buzz going early and your presentation is solid both in terms of content and design, you have a fantastic chance of getting on the SlideShare home page. In a recent study by Dan Zarella on HubSpot, the findings pointed to something that is very uncommon on other platforms: The longer a presentation is (up to 60+ slides), the better it’s likely to perform! Additionally, if you take a look at SlideShare’s most popular presentations, you’ll see a heavy emphasis on data-driven content. While this seems strange at an initial glance (you’d never see the same thing happening with Facebook users), it’s important to remember point #1 of this post: SlideShare users are largely a smaller group of professionals, and they crave professional content. While the above is a fairly meaty presentation, don’t be scared to go even bigger! You are not confined to the same limits as you might be with YouTube’s audience (which rarely sits around for anything longer than 3 minutes). Trying to perform well on SlideShare without implementing great design would be like trying to get started in content marketing without a solid company blog — an essential ingredient is missing, and it will drastically hurt your chances of success. Slideshows are a visual platform, without eye-appealing designs and a clear presentation format, all of that good information has the potential to be skipped (or misunderstood). A great design not only makes the presentation more enjoyable, but it also adds a sense of legitimacy and professionalism that even spectacular content just can’t create: People have a tendency to judge the trustworthiness of things online based on their design — even more so than the content available [source]. One thing that marketers must keep in mind when using outside platforms is that these sites can often have very authoritative domains, and that by implementing fundamental SEO techniques, they may be able to rank for quality terms and generate even more views for their content. I regularly do this with my own slideshows. In fact, one of my presenatations ranks No. 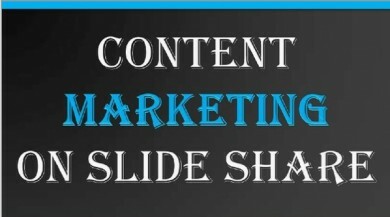 1 for “content marketing on SlideShare”… even over an official SlideShare upload! As a result, it now sits at more than 30,000 views with minimal promotion: it’s all been from SlideShare clicks and SEO traffic. Create content for humans first and foremost — that’s always been the golden rule — but don’t let it stop you from finding some solid keywords after the fact and making a sincere effort to rank for them: It can definitely help expose your slideshows to related searches. One great thing about SlideShare is that you can take existing content from your free resources or even from your blog and repurpose it in a visual format via a slideshow. This essentially allows you to get more mileage out of larger pieces of content on a brand-new platform, leading to more discoveries and leads from evergreen content you may have created ages ago. This lets you keep the e-Book content for opt-in purposes (or to distribute for free on your site), but also allows you to leverage SlideShare’s massive audience for more views and leads into your mailing list or sales funnel. While this feature is only available as a SlideShare Pro user, it’s incredibly powerful and deserves a mention here. This feature enables you to have opt-in forms appear in your presentation. These will show up if your presentation is being viewed on SlideShare.net or if it’s been embedded on another site, making it great for picking up leads from guest posts (mentioned above). Personally, I find that it is most effective when it appears at the end of the full presentation: Instead of forcing folks to commit to three or more clicks to opt in, they can now opt in from the very slideshow that they were just viewing! It’s an awesome addition that we’ve personally been able to use to collect leads at a surprising rate, I highly recommend trying it out on your own content. An oldie but goodie: Multimedia content is much easier to share across multiple sites than written content, for obvious reasons (no duplicate content penalty, etc.). Email outreach should already be a part of your content promotion checklist no matter what you are producing, but it is especially important for this sort of embeddable content due to the possibility of it being featured on multiple sites at once. It’s similar to a typical infographic promotion strategy: Since the content is visual and easily shared without running into the “duplicate content” issue, you can reach out to as many people as you’re able to see if they’d like to republish your slideshow. This, along with guest blogging, is pivotal in getting you those early views. Without them, it’s much harder to hit the SlideShare home page. The home page should be your goal with every upload, as getting featured can easily add thousands of views to your presentations and, more importantly, plenty of new leads as people follow your call-to-action. What platforms does your company engage on the most, outside of your company blog? Gregory Ciotti is the marketing guy at Help Scout, the customer service software that makes email support a fast, personal, and painless experience for your customers. Get more data on your customers with our free eBook, or follow us on Twitter @HelpScout.